Tamfula is another Choctaw dish that can be prepared the “long way” (that is, grind and soak the corn and filter it with wood ash then boil all day) or it can be simplified for our fast-paced lifestyles. I make enough in a crock pot to last for 3-4 days and eat it alongside vegetables, in soup, and by itself with salsa on top. Place ingredients in cooking pot and boil for three hours or until the mixture is soft. Traditionally, the dish was boiled for hours, sometimes all day. But if you cannot stand in front of a stove that long, then use a crock pot instead. Set on high and cook for four hours. You will need to stir it often during the first hour and check periodically to make sure it does not dry out. Add water or chicken broth when needed. 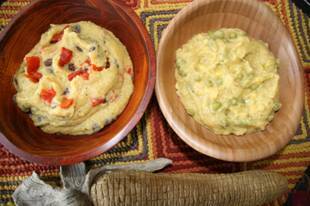 This recipe is similar to other corn dishes used by other tribes. Some like sugar or cinnamon sprinkled on top.